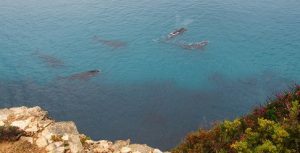 THE first southern right whales have arrived at Australia’s Head of Bight, marking the beginning of what is expected to be another bumper whale watching season. Two whales were seen in the shallow waters at the beginning of the week with a further sighting today. The whale season typically runs from May to October at Head of Bight near the remote Nullarbor Plain in South Australia. Last year, a team of researchers from Curtin University counted up to 172 whales including 81 mothers with calves on a single day – a record since data began being collected in 1991. About 33,000 people went through the Head of Bight Visitors Centre in 2016, which is on Yalata Aboriginal Lands and run by the Aboriginal Lands Trust. The centre, perched atop the Bunda Cliffs overlooking the Bight, includes several boardwalks and viewing platforms. Aboriginal Lands Trust acting CEO John Chester said a good number of whales and tourists were again expected this season..